Fund My Mutual Fund: Royal Caribbean (RCL) to $1? 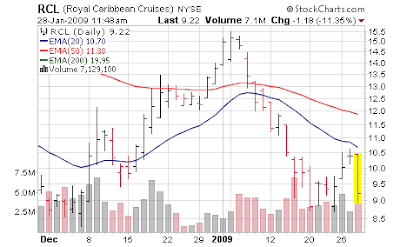 Royal Caribbean (RCL) to $1? One group I've missed as I've railed against consumer discretionary are the cruise lines; one reader had mentioned it in comments late last week so I started looking into it. An analyst is out today against Royal Caribbean (RCL) raising liquidity concerns - which is a kiss of death in this type of market. I assume cruise ships are not too big too fail, but who knows anymore. Barclays Capital cut its share price target for Royal Caribbean Cruises Ltd (RCL), the world's second largest cruise operator, to $1 from $20 and its rating on the stock to "underweight" from "equal-weight". "While it is well known that cruise demand has been declining precipitously since last fall, we do not believe the magnitude of the decline is appreciated," Barclays said in a note to clients on Wednesday. "While we believe RCL will stay solvent, we estimate the company would become precariously close to facing liquidity issues," Barclays added. A spokesman for Royal Caribbean Cruises told Reuters the company was in its "quiet period" ahead of publishing fourth-quarter results on Jan. 29 and would not comment on liquidity issues or any research reports. Barclays lowered its earnings per share estimate for 2009 to a negative $0.92 from $1.98 and initiated a 2010 EPS estimate of minus $1.22. It said it expected Royal Caribbean to miss fourth-quarter consensus estimates and report a 10 cents per share loss for the quarter. I'm adding this to my potential short list - I am afraid to get involved right ahead of earnings reports - competitors include Carnival (CCL). I haven't done enough homework yet on this grop to really differentiate. p.s. the other 2 shorts I entered yesterday are among the few red names on my screens. Now we have to all wait until 2:15 PM and then act like lemmings running off a ship based on the magic text of the Fed release.